Concept Zodiac chrono w/AOD. Batt gauge on left w/low power alert. Day dial with highlight on bottom w/Date. 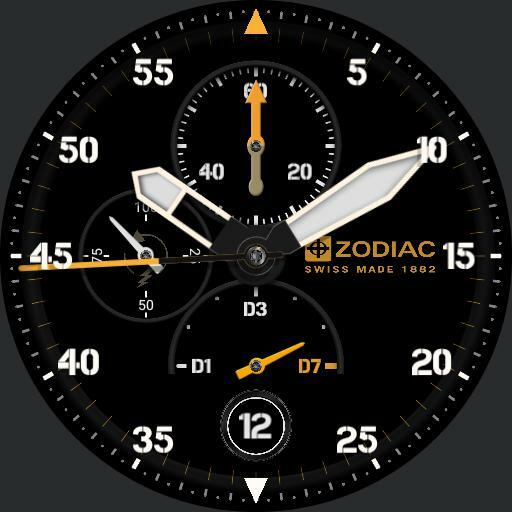 SW minutes dial at top, with seconds hand as SW seconds; SW start/stop at dial, and reset at Zodiac logo. Center tap-action for hands sweep to 3 oclock position. Top and Bottom dial triangles highlight AM bottom and PM top. Tried to add a bit of depth dimension especially noticeable on AOD. Not a pro at this, but trying... enjoy.